Over 50% of the population allows their dog to stay indoors and sleep on the couch or in their owner’s bed. For those of you who are interested in building a dog house for you beloved pet here are some simple rules to follow when considering what type of shelter you want to provide. 1. You should begin your dog house building process by making sure the house is big enough to accommodate your animal’s potential adult size. Humans enjoy having about 2 feet of air above us in a room in order to live without feeling claustrophobic. Your dog will probably also enjoy having that much room. The comfort zone for both humans and dogs is about 1/3 of their standing height. To figure out how much room the dog will need get out a tape measure and measure your dog. Measure him standing straight up, sitting on his haunches and above all measure the full dimension of the dog when he is the most comfortable, relaxed and stretched out position he can get into. Your dog should be able to look out the front entrance while both standing up and sitting. So the dog will not have to significantly lover his front shoulders or scrape his belly make sure that entrance is high enough. Stand over the dog and measure the width of the widest point of the animal’s shoulders. 2. Remember to raise the dog house several inches from the ground to allow air and water to flow underneath. To dissuade pests from invading the dog house and taking your dogs health into consideration remember how important ventilation is. Put in a few nickel-sized holes in the walls under the eaves. Install a wind block inside the house so the dog can use the heat of its own body to warm up the area if it is really cold or windy outside. Consider adding a partial wall which will allow your dog to escape the bad weather. Your animal can choose to just sleep in the entry room or go around the inner archway maze wall into the inner sanctum. Your beloved pet would probably love having a pillow or some sort of bedding to sleep on. 3. To avoid rain coming into the dog house make the floor just a bit slanted toward the doorway and build the roof a little bit slanted, as well. Make sure the house is well insulated but you should not paint the inside. 4. In the United States most storms come from the south and west so make sure the dog house faces a different direction. Most dog house plans suggest that the dog house door faces east. The cold air will not be able to whip through the entryway then. 5. It is suggested that you put hinges on the roof of the dog house. This makes it easier for you to clean out your dog’s home. You should clean the dog’s house as often as you give your dog a bath. If your dog lives outside then he deserves to have a comfortable place to sleep and get out of harsh weather. 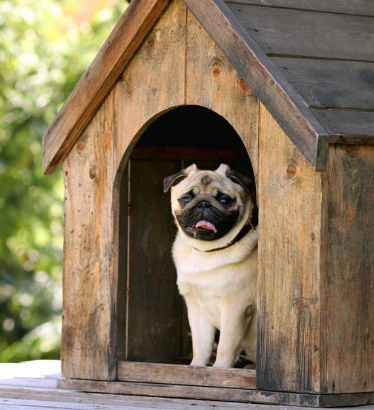 Hopefully these easy tips on building a dog house will help you get started. 0 Response to "5 Great Tips On Building A Dog House"